Do you love that gravy on those chicken breast? Well... You will love this recipe. Season the chicken breast with salt and pepper. In a large electric skillet set on medium-high heat, warm the oil. Add the chicken and cook, turning once, until browned on both sides, about 3 minutes per side. Transfer to a plate. Reduce the heat to medium and melt the butter in the skillet. Add the onion and cook, stirring occasionally and scraping up the browned bits from the pan bottom, until the onion is translucent, 3 to 5 minutes. Add the bell pepper, celery, the white portion of the green onions and the garlic. Cover and cook, stirring occasionally, until the vegetables are tender, about 8 minutes. Add the thyme and flour and stir well. Gradually stir in the broth and bring to a simmer. Return the chicken breast to the skillet and reduce the heat to medium-low. 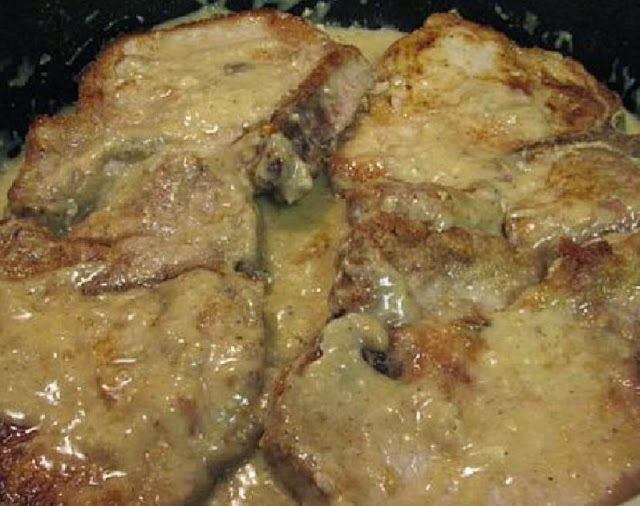 Cover and simmer for 10 minutes, then turn the chops over, cover and simmer until the pork shows no sign of pink when pierced at the bone, about 10 minutes more. Transfer the chops to a deep platter and cover loosely with aluminum foil. Stir the cream into the gravy in the skillet and bring to a boil. Cook until thickened, about 4 minutes. Stir in the green portion of the green onions and the 1 tsp. hot sauce and season with salt. 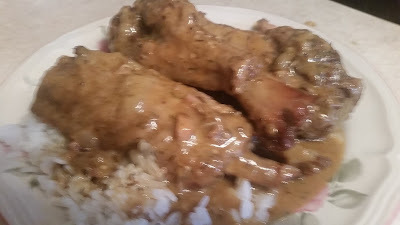 Pour the gravy over the chicken breast and serve immediately with steamed rice. Pass more hot sauce at the table. Serves 4.